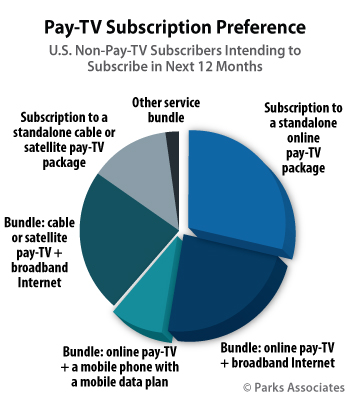 New research from Parks Associates shows that 6% of U.S. broadband households are highly likely to subscribe to an online pay-TV service within the next 12 months, which would more than double the number subscribing today. While traditional television subscriptions held quite steady from 2010 to 2015, they have declined year-over-year since 2015. Significantly, the percentage of households “cutting the cord” has increased between 2015 and 2017. Parks Associates also reports a larger number of “cord-never” households, though a much greater percentage of consumers are either testing new options or still in decision mode. Price, cost, and low price/value perceptions dominate as reasons for pay-TV cancellation and cord shaving. More than 50% of households that have switched, shaved, or cut the cord in the 12 months prior to Parks Associates’ survey said that the reason is that their pay-TV service was not worth the cost. Parks Associates also found that about a third of cord cutters would have stayed with their service provider if offered a Netflix-style service bundled with broadcast TV channels. Providers must replace revenues lost in the wake of fewer subscribers. However, only one-quarter to one-third of consumers are willing to pay more for their pay-TV services, even given the addition of highly appealing features. Thus, providers must prioritize consumer retention. Given that Parks Associates found that many pay-TV subscribers are unaware of the video on-demand (VoD) features available to them, pay-TV providers must do a better job in communicating VoD offerings, or they will lose consumer VoD viewing to online options. Providers should also consider adding the features that Parks Associates found are most appealing to digital video consumers (pause, restart, and rewind) for no extra cost in order to incentivize maintaining their pay-TV subscription. The good news, according to Brett Sappington, Parks Associates’ Senior Director of Research, is that streaming is well-established, and consumers are familiar with its function, even without a deep understanding of the technology. And, while percentage of potential shavers and cancellers has risen, Sappington points out that many consumers are comfortable with what they have and not in a rush to change. This lapse provides providers and entrepreneurs openings for creative solutions to bring consumers ever closer to their ideal vision of price/value and feature excellence.